I've never forgotten that day. I probably never will. I forget many things these days, but that day, will stay in my mind forever. The truth had been revealed, yet again, and I was moving. I was going somewhere safe, where he would never touch me again. I was 13 years old, and that night it happened. I walked into the bathroom, washed my face, fixed my hair, and put makeup on. I looked into that mirror, deep into the eyes that boldly stared back at me with a defiance I'd never seen before. And as though a switch had been flipped, suddenly the reflection that looked back at me changed. I saw myself there. Right there, was me, but it wasn't. The chills I felt, the tears that wanted desperately to be released, and the pain that wanted nothing more than to escape the tight, angry hold that locked it away, were fighting a battle I had no control over. In one night, one moment, the reflection in the mirror was lying. Because while it was my face, my hair, and my body, it was never me. It would be decades before I would share the rage, the evil I could literally feel pouring out from every inch of my body. 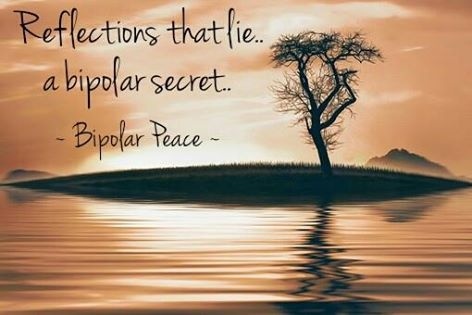 I would spend years having no idea what bipolar is, I would live secretly believing I had multiple personalities, trying to control the extreme changes in mood and behavior I would experience. When people saw me, they saw the same person who existed the night before 'the change'..but I knew.